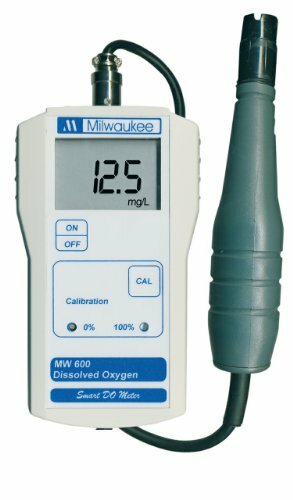 The Milwaukee MW600 is a portable dissolved oxygen (DO) meter for educational, aquaculture, water analysis, and environmental analysis applications, with an LCD screen and polarographic probe with 3m cable and screw-on cap membrane. The meter has two-point manual calibration and automatic temperature compensation from 0 to 30°C. It runs on one 9V alkaline battery (included). DO meters are commonly used in water-quality testing applications. Dissolved oxygen (DO) meters measure the amount of dissolved oxygen present in water. The amount of DO helps to determine, for example, drinking water quality, the health of lakes or streams, and aquatic organism sustainability. A probe, also called a sensor or electrode, is inserted into the sample to perform the measurement, and the results appear on the meter display. Applications include sewage and water treatment plants, pollution control, fish farms, and various types of manufacturing. Milwaukee Instruments manufactures electrochemical instrumentation and solutions for water analysis under the Milwaukee and Martini brands. The company, founded in 1989, is headquartered in Rocky Mount, NC. View More In Lab Instruments & Equipment.